This year's National Meningitis Awareness Week is fast approaching. Between the 20th and 26th of September there will be a number of organisations helping to improve people's understanding of the disease. Meningitis and septicaemia can kill in hours. Meningitis is the inflammation of the lining around the brain and spinal cord. Septicaemia is the blood poisoning form of the disease. Almost anyone can contract the disease but babies and toddlers are at increased risk. As Mellow Mummy reader Janette from Devon knows all too well, spotting the symptoms of the disease early can make the difference between life and death but you need to know what to look for. On the third night in the hospital the doctors came in and told me the 'good news'. “I think we can tell you that his life is out of danger. Had you not got him here when you did I think he would have died in a couple of hours!”. The septicaemia rash was doubling every 20 minutes. Janette will be sharing her heart-wrenching story with us on Mellow Mummy next week – get the tissues ready! The Brother Max questionnaire can be found at http://www.brothermax.com/meningitis-questionnaire and only takes 2 minutes to complete. All participants who complete the survey by 16th August, will be entered into a draw to win a Brother Max Scoop High Chair (worth £279.99). Once the survey is complete, all those who have taken part will be emailed the results and the correct answers, raising awareness and understanding all round. Please take a moment to fill in the questionnaire. Thanks. 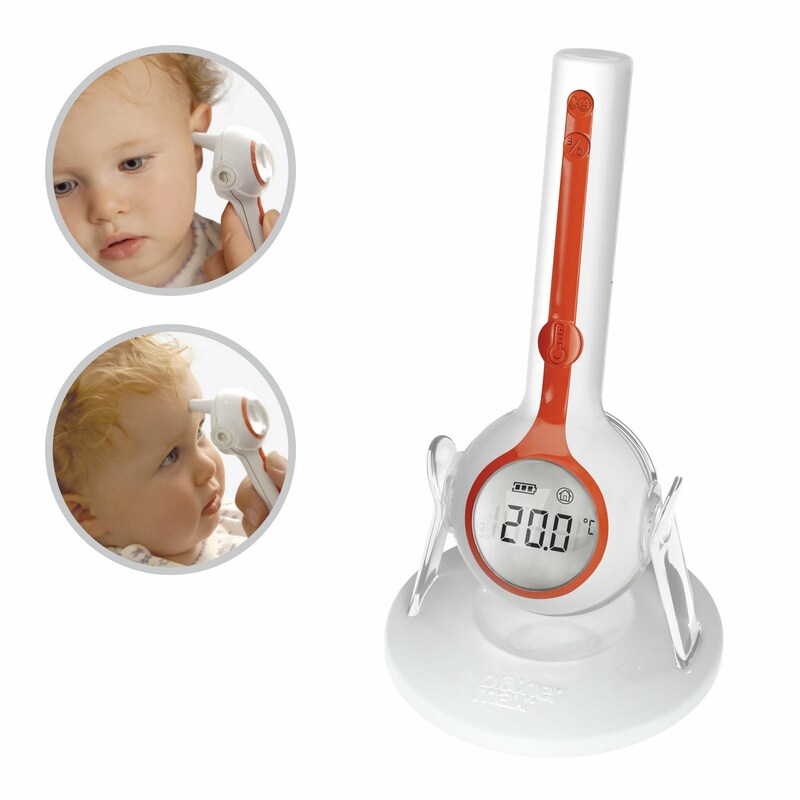 This week we have been using the Brother Max 3-in-1 Thermometer. When Lara is unwell, I had been using a small, cheap (£4.99) digital thermometer to take her temperature – it was stressful as she would never stay still long enough for it to take a reading (upto 40 seconds). I have always rated the design of Brother Max products so I knew that their thermometer would make things easier for both me and Lara. The Brother Max thermometer has blown me away. It is, quite honestly, awesome. It can take a child's temperature (or adults!) from their forehead or their ear and can give a reading in about 1 second. Now that is more like it. No more wrestling with a stressed wiggly baby. The reading is accurate to within 0.1 degrees. We loved the fact that it can also be used as a room thermometer and has a back light to make it easy to see the reading even in the night. It is also incredibly easy to clean. No messing about with alcohol solutions (as I was supposed to do with my old thermometer), or replacing of ear-probes. The Brother Max 3-in-1 thermometer is specifically designed to be cleanable using a baby wipe. Owning this thermometer means that I now have complete confidence that I could detect and react to Lara's temperature quickly if it were to rise. The Brother Max thermometer costs around £34.99 and is available from all good nursery retailers such as Mothercare, John Lewis, Kiddicare, Jojo Maman Bebe and Amazon.